By Georgia Cheer. 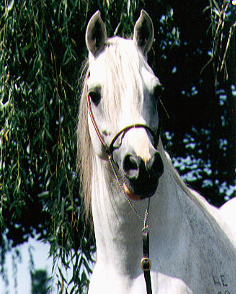 Daphne and Keith Gilbert began their Star Arabian Stud in 1971 when they purchased two gray mares from Crabbet. Those mares were AURORA (Oran x Shadowlight), who was foaled in 1966, and SELINA (Hanif x Dancing Diamond) foaled in 1968. Sadly, SELINA had died in 1999, AURORA the year before and their stallion INDIAN REFLECTION had passed away just a few months before my arrival in the summer of 2000. It seems my stud visit was far overdue and regrettably I had missed seeing these lovely Crabbet treasures.